Think Again Laser Clinic specialises in the field of tattoo removal, it’s all we do. The aim when opening the business was to establish ourselves as the number one choice for Laser Tattoo Removal in Australia, by offering a safe and effective service, performed using the highest level of technology that is currently available to the public. 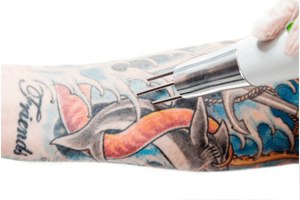 Since coming into the Tattoo Removal industry in 2014, we have seen rapid change in many areas, and in some cases we have even seen regression. Something we are working hard to change. We ourselves have evolved, training new staff, upgrading technology, and with an absolute focus on not only providing the fastest, safest and most effective results, but also the most affordable prices. Our drive for constant improvement will never cease, something that our team will always use to place pressure on the other providers. Think Again Laser Clinic began with a slogan ‘Recreate the skin you’re in’, and we got right to work using our old ‘Quanta Q-Plus C’ laser which is no longer in use by our team. Three years later in 2017 we became the first Tattoo removal clinic to upgrade to the Quanta Discovery Pico Plus. Since then, with what we learned and encountered we have updated our slogan to ‘Results, Reputation, Reality’ and these are the three core principles that any person considering tattoo removal must research to ensure they do not become another case study of tattoo removal gone wrong. So what are the key findings our team have developed through becoming the most experienced tattoo removal team in Australia? With the arrival of the ‘PicoSure’ laser, Cynosure was yelling from the roof that all other lasers were obsolete. 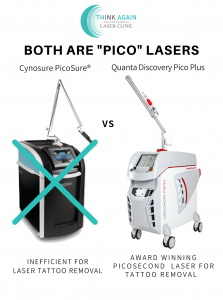 Think Again called them out on the science of this system before any other clinic (Quanta Q plus C vs PicoSure’), there is no doubt that their claims were fraudulent, and Cynosure are the subject of a class action lawsuit, proving our call out correct. You see the science behind any laser doesn’t lie and it is available for anyone to find online. It is constant and when interpreted by a professional who knows their industry, the science alone will indicate the effectiveness. But what lasers are ok to be treated with? Aside from the Quanta Discovery Pico Plus, there are other decent pieces of technology on the market. But they will ALWAYS be supported by a process. You will have people tell you their laser is superior, but don’t take their word for it, challenge them. Ask them why. Get them to explain to you the science. If they cannot, steer clear. They should have a vast portfolio of removals to show you to match their claims. With the most extensive portfolio of Tattoo Removal Results in the industry, we assist hundreds of people per year in achieving their dream of bare skin. Our clients are forever thankful, and more than willing to share feedback, because they understand that tattoo removal is a process achieved over time. We are allowing our clients to opportunity to forget about the once permanent tattoo they had. They are all more than happy to share their experience online in honest feedback. So ask yourself this, where are all the people singing the praises of the clinic you want to go to. In fact, when you are in the clinic ask one of our specialists for the before and after photo of each person who has left a review, and we will be more than happy to show you. There isn’t another Sydney clinic with a reputation like ours. We offer a free consultation which we use to educate on our process, secure a time today to discuss the removal of your unwanted tattoo. These are all designed to have you commit to a never ending treatment package that you can’t get out of, when in reality, all you want is a fair price, honest assessment, and effective service. 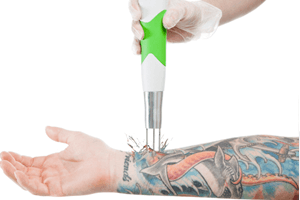 By being the most experienced, best equipped, and most respected tattoo removal company, we offer a fair price, guaranteed results using science backed technology, and a smile to go with it. We don’t need to price match, because we quote the fairest price the first time! There are no secrets, smoke and mirrors or marketing tricks. We will explain, show and prove to you why we are number one. We would love to never again hear the stories of people paying thousands of dollars upfront and being either damaged or getting very poor results, but unfortunately they come to us every week. By putting in the research before committing to a company, you may save yourself thousands and years of wasted time. 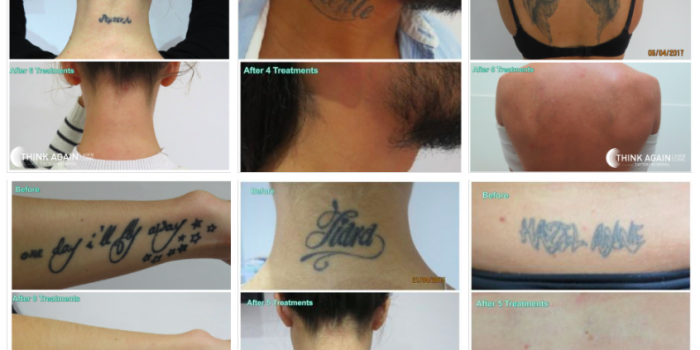 Our tattoo removal results portfolio is the most honest and comprehensive in the industry. Every image is unedited, achieved by our operators, and importantly lists the NUMBER of treatments it took to achieve removal. This allows most people to take a look at our work, and make a rough assessment of how long it will take for something comparable. If there are no numbers on a tattoo removal before and after, why? Can you be assured you will be told an honest answer of how long that removal took? Do they not want the client to see their work and dispute the number of treatments it took? Or are they simply aiming to deceive you? A good laser in bad hands is scary! With the newest generation of Pico devices, scarring to the skin is almost a zero chance (we have never scarred a single person in over 8000 treatments), however we still see weekly someone who has gone to a clinic that is a side business to a beauty clinic, hair dressing salon, or tattoo shop. If you are walking through a salon to get to a back room that doubles as a ‘tattoo removal’ clinic, are you in good hands? 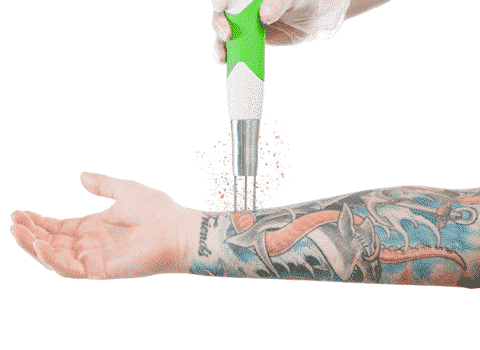 ALL we do in our state of the art tattoo removal clinic is tattoo removal. Conducting up to 100 treatments per week, we are constantly expanding on our field of knowledge. Our staff are the most highly trained operators in the industry and set the standard for safety, results and reputation. If you choose to go to someone who is not solely focussed on tattoo removal, they may be doing up to 10 other ‘treatments’ like pigmentation, hair removal, and we have even seen massage or spray tans! How much time each day are they spending perfecting their thousands of different techniques to safely and effectively removal all types of tattoos. No two tattoos are treated the same at Think Again Laser Clinic, because no two tattoos are the same. Placing yourself in the hands of someone not specialising in the field is placing you at risk of poor results, and also permanent damage. So there you have it, these key takings are something EVERY single person considering tattoo removal should address. If you do, and you find the best answer to each of these in the clinic you are considering, than there is a very good chance you are in good hands. Hands that will be able to achieve both safe and effective results. We believe that by continuing to lead the pack across the board, the result will be that the consumer will eventually be educated enough to identify the right clinic every time. If something doesn’t sound right, it usually isn’t. Ask more questions, speak up, and don’t be scared to get a second opinion. Tattoo removal is a second chance that you only get one shot at. If it goes wrong and results in damage to the skin, there is very little that can be done to help you. Contact the clinic to find out WHY we are the number one rated tattoo removal clinic! Look out for big things to come from the Think Again team in 2019, we feel like its going to be our biggest year yet!